At first glance, the American Bobtail looks like its undomesticated counterpart; wild, untamed and dangerous. 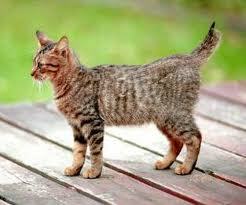 The American Bobtail is a medium-large feline with a naturally occurring bobtail. The body of the cat should be moderately long and rectangular in stance, athletic and well-muscled with an appearance of power. The legs should be in proportion to the body, rear legs slightly longer than the front, with large round paws and a naturally rolling gait similar to the wild bobcat. Tufts of fur between the toes are preferable in the long-haired version. The naturally occurring bobbed tail should be short and flexible, able to be seen above the back of the cat when held alert, but not longer than the hocks; the tail should be set in-line with the hips. 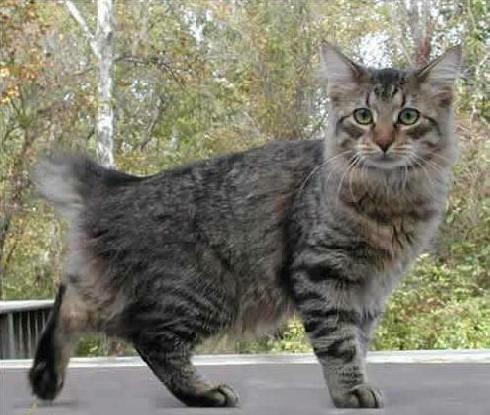 No two tails of the American Bobtail are the same; they average in length from one to four inches, however some may be longer and others shorter. 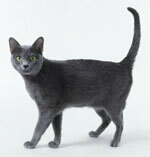 Those without tails, called Rumpies, are not encouraged as the shortened spine can cause health problems. The head of the American Bobtail is a broad modified wedge with good length between brows and ears; jowls and widening of the head should be noticeable in males. The breed displays a distinctive brow, with large, almost almond shaped eyes that are deep set. The nose is wide through; ears medium length and wide at the base with slightly rounded tips. 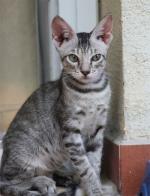 Tipping and furnishing of the ears is highly desirable as are light colored thumbprints on the back of all tabby ears. The cat should possess a natural hunting gaze that helps to give the wild appearance. 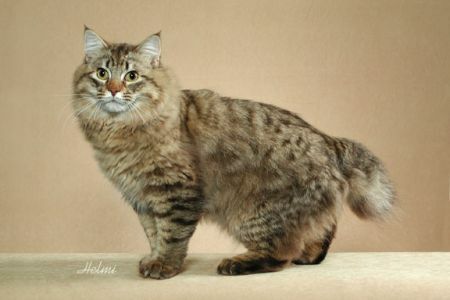 The coat of the American Bobtail should be non-matting and resilient with double density, a slight loft, and shaggy appearance. There are no color restrictions, all possible colors and combinations are accepted with preference given to those that enhance the "wild" look of the breed. High rufusing, or reddening, of the coat is preferable in tabbies. Buttons and lockets are also permissible; all eye colors are accepted. 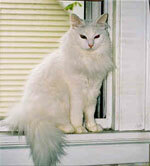 The American Bobtail is a cat of delightful temperament. Affectionate and intelligent, they love to be cuddled and bond with their families. They posses an exceptional disposition, are highly adaptable, dog-like in their devotion and are a joy to have in the household. Bobtails love to play games including fetch and hide and seek, and though quiet in voice will trill, chirp, or click as they are delighted by your attention. You may want to lock up your jewelry, however, as the cat is enchanted by all things shiny and they are known for making off with and hiding valuables. Easily leash trained, this is a breed of cat that would love to accompany you on your evening walk. The American Bobtail loves other pets and is a treat for children, tolerating any manner of holding including the "sack of potatoes". When started at a young age, the breed is an excellent traveler and is often the choice of companion for long-haul truck drivers. The breed is even used in psychotherapy programs as they are exceptionally well-behaved and sensitive to people in distress. Caring for an American Bobtail is quite simple. Their coat is non-matting and requires only an occasional brushing. Health concerns stem from the shortened spine; the breed is also prone to bloating. Regular check-ups with an animal health professional are encouraged. 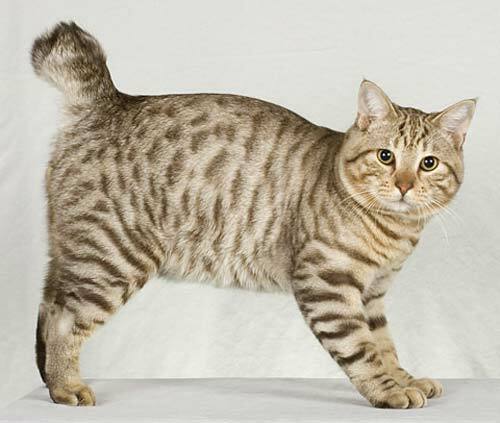 The complete history of the American Bobtail is unknown, but this is a truly "Born and Bred in the USA" breed. 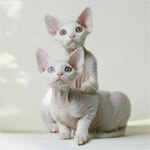 Its beginnings can be traced back to a short-tailed tabby male name Yodie, and a seal point Siamese. Yodie's parentage is unknown, however he is believed to have been a bobcat/domestic hybrid due to the shortness of his tail. Their resulting offspring were then crossbred to Birman, Himalayan and Siamese hybrids resulting in a bobtailed cat with long hair and pointing. The first standard for the breed, demanding these characteristics, was developed in 1970. The genetic pool was too small, however, and most early bloodlines faded out as the original line became too inbred to be useable. In the early 1980's, the standard was relaxed and the newly improved Bobtail was bred. The American Bobtail is one of the newest cats to receive CFA approval. It was accepted into the CFA in 2000 and received Championship status only in 2006.